Quite regularly we hear from people trying to decide whether they should buy a TV or a projector. A good 20 years or so ago, the answer to that question was a very easy one. Unless you had a room that could be completely blacked out, projectors just couldn’t compete. Fast forward a few years, televisions are getting larger and home theatre projectors are becoming cheaper and more sophisticated. And the answer is not as clear cut as it used to be. These days, the answer tends to be: it depends. The very first question you need to ask yourself is what your personal circumstances are: your room, your viewing preferences, your house mates, your budget, your skills, the time you spend in your home theatre (dedicated or not). If you are in any way serious about watching movies or if you happen to be an avid binge watcher of Netflix series, it is definitely worth the consideration. Both products have their advantages, so here’s our attempt to try and make the decision between a TV or a projector a little easier. Image size has always been the calling card of projectors. Especially when you are a movie-lover (but also gamer, binge-watcher or sports fan), having the luxury of a true cinema-like experience from the comfort of your home is unbeatable. There is just nothing like it. Even today with TV’s taking on massive dimensions, when it comes to size, a projector with projector screen wins. Hands down. Contrast ratios and black levels for projectors have come a long way. It makes that the image quality of a projector certainly competes with a television. Personally, we prefer the contrast ratio provided by a projector over a TV. That said, the newer OLED and QLED TV’s are pretty impressive when it comes to contrast ratios. Because projectors provide less overall brightness (light is projected on the screen, not the other way around), the viewing experience is a lot less straining on the eye. Ambient light is the major drawback with projectors. That’s because it has an effect on perceived contrast of your image. Unless you have the room darkened or choose a projector that handles ambient light well (these days there are good options, but they tend to come with a heftier price tag), a projector’s performance will be affected by ambient light that comes into the room. That said though, even if you don’t have a dedicated home theatre, usually getting your room darkened to a point that it is workable for the average projector is quite achievable if you want to make it work. To some people, the installation and set-up of a projector might be a little intimidating. If that is the case for you, you may want to prefer to have your projector installed. Ease of installation also differs quite a bit from one projector model to the next, so it may be a decision factor to keep in mind. Also, you want to recalibrate your projector on a regular basis. Some people enjoy spending time on the tweaking, to others it is a massive burden to be avoided at all cost. These days, there are both projectors and TV’s that handle HDR. But if this is important to you, a TV might be the better option. Things are improving when it comes to HDR and projectors, but we’re not quite there yet. The big minus of the projector plus screen is the biggest draw for the television. There is simply no going around that if you want to watch a movie with the lights on, a television is easiest way to go. There is the option of a projector with higher brightness for use in a room with ambient light, but that means you will add to cost of your set-up. No question. Also, families with small children around that like watching their own programs, might again find a TV to be the answer for now. We keep repeating ourselves, when it comes to ease of use, a TV is unbeatable. When it comes to 4K viewing, standards are a fair amount clearer for TV’s. When the specs of a TV say it is 4K, it means it has a resolution of 3840 X 2160. No arguments. Not necessarily so with a projector. With the projector upscaling technology, you may or may not be looking at a true 4K resolution projector (read our blog about 4K is not 4K is not 4K). While any of the 4K home theatre projector options provide an excellent image, the large image that is projected on a massive screen is just stunning in true 4K resolution. Oh, we are so excited about native 4K projectors coming down in price! If you’re only a moderate watcher of movies and you have to make do with the living room, a TV tends to be more ‘acceptable’. Absolutely, it is possible to disguise both the projector and the screen in a way where it doesn’t interfere with the decor in a living room. But a TV is still the more straight forward choice to most people. In short: even with TV’s being bigger than ever before, they still are smaller than a good sized screen. There’s no going around it. It’s so much easier to appreciate 4K content on a large acoustically transparent screen with the LCR sound coming from the speakers placed behind the screen. You’re just IN IT. Not a chance in the world a TV (even a big one) is going to give you the same experience. If you can get your viewing room really dark, a projector’s lower light output can be more comfortable to watch. We mentioned before how watching movies on theatre screen is a lot easier on the eyes. Like the home theatre we installed in the picture above, there’s a fair amount of our customers who end up going for both. A television for use in light conditions and casual watching and a projector to enjoy a real big screen movie experience. And there is a lot to say for that decision. Obviously, you double the price tag. So, if that is not an option for you, you will have to weigh up the pro’s and con’s we listed above. While you probably gathered by now that we do love watching our movies projected on a big screen, we will certainly say that a projector and screen is not for everybody. 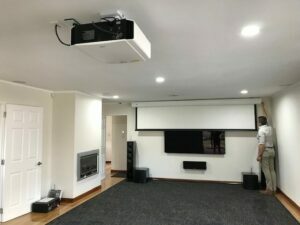 But for all people who just perk up from a good movie on a big screen and pull out the laptop for any other casual viewing (truth be told, that is totally us), a projector and a screen becomes a desirable option despite some of the traditional arguments against a home theatre projector. These days, these ‘buts’ and ‘ifs’ no longer need to hold you back if you are happy to work around them. There honestly is a solution for just about every obstacle you may encounter if a home theatre projector and screen are what you want. Need to work with ambient light? No dedicated home theatre room? Just do it! The options available to you might just be a little more limited. Your wallet may be a bit slimmer. In the end, it all boils down to how much you want it… The result will blow you away, no doubt. And with that we leave you for another week. As always, give us a ring if you want advice. We are more than happy to help out.